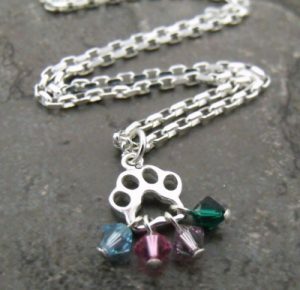 Paw Print Birthstone Necklace for Multiple Fur Babies! When we have been blessed and honored to have been loved by one or multiple fur babies, what better way to keep them close to our hearts than to have their birthstones and a shiny paw charm dangling by your heart! They will forever be with us whether they’re with us here on earth or waiting for us in heaven. Their love is eternal!! Paw lovers, this sterling silver open paw charm has multiple sparkling Austrian crystals ( birthstone colors chosen by you) representing each of your fur babies, dangling at the bottom of the charm. If you only need one, that’s fine too! Personalize it by choosing each birthstone color you’d like! This sterling silver paw print, multiple crystal birthstone charm necklace is for you ~ the animal lover, dog lover, cat lover and “fur” mom! Continued Paw Blessings to all of you!